Global wholesale services provider Telia Carrier announced it has added a new point of presence (PoP) that enables connectivity services for a growing economic sector in Berlin, Germany via the Carrier-Colo data centre, owned by I/P/B/, which offers connectivity and IP services to international, national and regional start-ups, carriers, cloud and content providers. 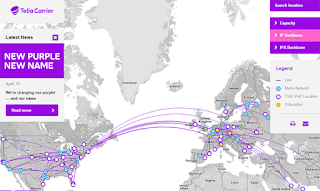 Located between Frankfurt, Germany and Warsaw in Poland, the new PoP follows Telia Carrier's recently launched low latency DWDM route, the Frankfurt - Warsaw Express, and will meet increasing demand for connectivity in the German capital. In partnership with I/P/B/, a local ISP, Telia Carrier is able to serve start-ups, as well as established and international businesses wishing to establish a presence in Berlin. The data centre facility hosts the highest number of networks and fibre connections in the region. Telia Carrier noted that it has already brought a number of customers online, and expects to add more leveraging its relationship with I/P/B/. The Carrier-Colo facility, located near Potsdamer Platz in the centre of Berlin, is designed to support carrier-lass colocation and IP interconnection services. The data centre serves as a hub between West and East Europe on route to the east and emerging markets. Recently, Telia Carrier announced it had established two new PoPs in St. Petersburg, Russia in response to growing customer demand. The new facilities, Miran and Selectel, are intended to support IP transit, Ethernet and wavelength services at rates up to 100 Gbit/s, in particular for content providers and operators within Russia and the Baltic states. In January, Telia Carrier announced its new route extending 900 km from Stockholm, Sweden to St. Petersburg via Tallinn, Estonia. At the same time the carrier stated it had upgraded multiple submarine cables across the Baltic Sea using coherent Flex-Grid technology to add capacity, lower latency and enable the delivery of 100 Gbit/s and higher rate services to carriers, content and cloud providers in the Baltics, Russia and beyond.